Hundreds of producers and engineers make their living by working alongside underground bands that are self-funded and mainly need studio time to record their first releases. Based in Warwickshire, Tom Gittins works out of his Monochrome Productions studio to help such bands with their projects, and you can read about his work in our chat below. Hi Tom. Why does rock remain your genre of choice when the bedroom producer explosion has put a focus on electronic music and various indie sub-genres? Some would even say rock-n-roll is dead. Well, I work with absolutely all genres across the board, but as a large umbrella genre, rock-n-roll is definitely not dead. There will always be rock fans. The visceral sound of a distorted guitar and powerful drum kit is too iconic to fade away. That being said, I’ve continued to work in rock music because of my previous background in it. I grew up being into rock, which inspired me to play in those sorts of bands and learn how to record them. Some people have the impression that recording bands requires an elaborate setup of gear and long recording chains. Have you found this to be the case? I’ve worked with several hundred different bands over the last eight years, and have been surprised by the simplicity of certain rigs that are still able to achieve massive sounds. For example, one band I’ve done a lot of work with Dance à la Plage, an indie-pop band. Their sound is full and rich because of nice chord articulations and the variety of clean guitar sounds they use. The main rhythm guitar sound is usually just a Fender Telecaster through a Fender Hot Rod or Blues Deluxe; a very simple setup. No vast arrays of effects processors; just honest signal, and great performance. What do you think is necessary to maximize the sound of a simple rig or recording chain? Some people don’t even have a lot of gear to choose from in the first place, or may have a budget when shopping for new equipment. I’ve always been of the opinion that having less gear that you know exactly what to do with is going to take you further than masses of gear that barely gets used. Even if it’s cheap, having simple gear that just does something specific that you like is a better way to go. In terms of tracking, I’ll always track more channels than I may need. A variety of different mics around the same source, not all of which will stay in the mix, can open up options. You can vary the mix balance of those mics later on. However, when it comes to mixing, you can only work with what you have. One fail-safe I have is to always track a DI from a guitar. Even if you have a limited mic arsenal, you can always re-amp the performance itself later on. I always say to people who send me stuff to mix that they may have recorded themselves that it’s best to include the DI of all bass and guitar parts. It’s not unusual to find yourself in situations where the guitarist feels 100% convinced that they have a great rig, and ask you not to mess with their tone. But he may not be aware that the guitars could struggle to cut through in the mix. Having the DI allows you the option of re-amping things, which helps. Can you tell me a bit about your gear setup at Monochrome? When you work with artists that have a limited amount of time and budget for their projects, you need to be able to work quickly and progressively. Because I jump in-between so many different projects, I mix pretty much entirely in-the-box. I only use analog gear to mildy color things on the front end of tracking, like some Pultec style EQs, TLA and Focusrite compressors and some great Universal Audio preamps. The studio is well equipped with a variety of great guitars,basses and a large backline collection from Marshall, Fender, Mesa Boogie, Laney, Orange, Kemper etc. Do you think there’s template way of recording drums that can work across multiple genres? 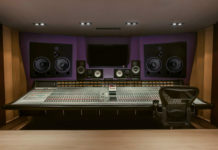 Every single recording, micing and mix decision is based on the genre. I’ve heard horror stories of similar-sized studios to me, where engineers and producers aren’t engaged in what the band is trying to do, which in my opinion, screws things from start. I ask a lot of questions before even starting on a project, which some bands may find odd. It helps me do my job right. No two projects are the same though. Even if you use the same SM57 on a snare for different projects, that doesn’t necessarily have a bearing on how you’re going to process it in the mix. For example, a modern-sounding indie band might want their drums to sound fairly sharp, tight and dry, whilst a classic rock band will want something deeper, looser and more distant. Good engineers will know straight away what certain recording techniques should sound like in a finished mix, and will work backwards in their heads from a finished mix to what decisions they’re making at the micing staige. That’s why it can be wise to track in such a way that enables you to keep options open. I’ve had situations where bands that are fairly new to the recording process will have a specific drum sound in their head, but when hearing the raw, unprocessed micing they get nervous. But tracked drums is usually a far cry from how they end up sounding after the mix. I generally prefer to sub-mix each instrument after it’s been tracked. In modern rock records, the kick and snare are much louder compared to how it was fifteen years ago. So I’ll do a sub-mix of the drums to give them some “oomph”, and then bring them back into the main session afterwards. When the drums sound like that, the bass and guitar players play with a lot more confidence during multi-tracking and overdubs. Vocals presents itself as a challenge for some engineers, particularly when it comes to making them sound upfront. How do you deal with giving your vocals the required presence? Broken Witt Rebels is a band you’ve worked with whose vocals I like. It’s a combination of the type of mic, proximity from the mic and processing afterwards, but it also has to do with what you would term an “upfront” vocal. “Upfront” for a gently-sung female ballad isn’t the same as an aggressive punk-rock track. Delivery is paramount. Some vocalists that do great in a live setting might not translate to studio sessions, because they’re so used to moving their heads around, and not staying still in front of the mic. Also, a valve or condenser mic is going to be way more sensitive than a dynamic mic such as the Shure SM7B, so you need to be mindful of what you’re picking. Having the right pre-amp helps a fair bit too. Pre-amps can be an ambiguous area for engineers and producers that are starting out. 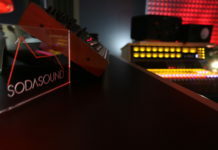 They tend to be less intuitive than microphones and compressors, which are quite clear in what they do. How would you describe the job of a pre-amp? I guess you could compare it to asking a guitarist if they’d rather play a valve amp or solid state amp. The valve amp will always have more character, even at the same gain. Warmth and headroom is what pre-amps are about. Some pre-amps will have gentle EQs in them too. They are usually very subtle contributions, but coupled with the right mic, positioned well on the right source, those differences across an entire multi-track session can really add up to a great combination that makes the mix process easier. 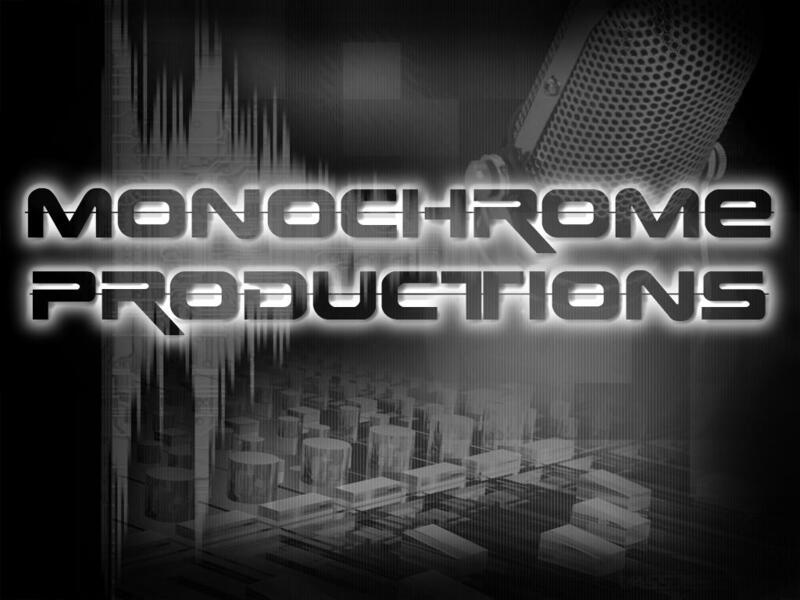 Do you have any other ambitions other your work at Monochrome that you want to get off the ground this year? I love working with bands, and seeing the dynamics between live musicians. For those dynamics to work well in the studio, they have to feel comfortable with you as an engineer. Over years, what I’ve become increasingly frustrated with is when a band makes something great, but because of the chasm that exists between underground bands and mainstream acts, they don’t know what to do with it, other than upload it to their own website. So they’re left to wait and see what happens. The development deal is a far more scarce opportunity these days, so I’d like to be able to do more to help bands that need a leg-up. Not all bands need that of course. Some of them are happy to be local heroes and play hometown shows. But others want to go further, and understand the hard work involved, and I’d like to help those musicians by setting up a platform that would allow them to self-assist more. You click on some of these band’s websites and the presentation is horrible, even if the music is great. So I’d like to be able to help with things like that, and get the right people to be made aware of them. There is a vast amount of talent out there under the rocks and stones…and many of these larger companies are missing out by not finding them!